The Cisco VPN client allows you to access Union College resources from a computer when you are not physically at Union College. There are two types of uses that will require using the VPN client. One such use will be to access web‐based resources such as databases at Schaffer Library. The second use (AnyConnect) will be used to access network storage, course resources, and software. It is necessary to use the AnyConnect client if you want to run Outlook when you are not on campus. You will be prompted for login information. Set the Group to FACULTY, STAFF, or STUDENT depending upon your "status” at Union College. Enter your Union College username, without the @union.edu, and your password. Click [Login]. You will see a dialog box welcoming you to the Union College VPN Server. Click [Continue]. Enter the URL for the Union College resource that you want to access into the blank Address box. For example, if you are trying to get to Schaffer Library, you would enter www.union.edu/Library in the box. Then click on [Browse]. Until you close the browser window, you will be using the VPN connection. If you want to return to the homepage for VPN, click on the house icon located in the upper‐right corner of the web page. When you are done using VPN, click the red X next to the house icon (see below). You will be prompted for login information. Set the Group to FACULTY, STAFF, or STUDENT depending upon your “status” at Union College. 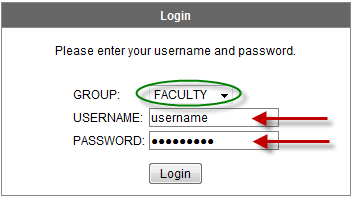 Enter your Union College [USERNAME] (without the @union.edu or @garnet.union.edu) and your [PASSWORD]. Click [Login]. You will see a dialog box welcoming you to the Union College VPN Server. Click [Continue]. You can start the installation of the AnyConnect client by clicking on the [AnyConnect] button on the left‐hand side of the window or by clicking on the [Start AnyConnect] link in the center of the page. You may receive a security warning at the start of the installation (see below for examples of Windows and Macintosh warnings). Click [Yes] or [Allow] in order to continue the installation. The AnyConnect client will install to your computer. After it successfully installs, you can use any application that will only run if you are on campus (e.g. applications that require access to a license manager) as well as use Remote Desktop applications to access computers that are on‐ campus. Once the AnyConnect client installs to your computer, you just need to start it before starting the licensed application or the Remote Desktop application. If you are having difficulty or you have unanswered questions, please contact the Help Desk through the ITS Service Catalog or call (518) 388-6400. Check out this knowledge base article I found in the Union College knowledge base. 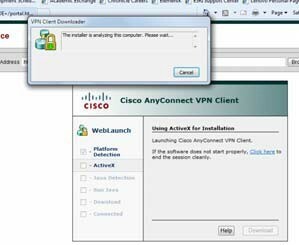 https://union.teamdynamix.com/TDClient/KB/ArticleDet?ID=56060 How to Use the Cisco VPN Client The Cisco VPN client allows you to access Union College resources from a computer when you are not physically at Union College.